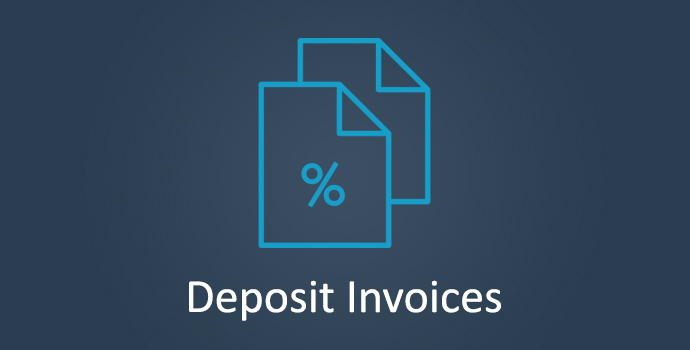 This extension allows you to create deposit invoices by adding a new ‘Deposit Invoice’ button to the Invoice editing screen. Simply click this button and then add either the percentage- or fixed-amount that you want the deposit to be. Your invoice will then be split into 2 invoices – a Deposit invoice and the other will be the Balance invoice. For example: if my current invoice is for $2,000 and I want to get a 25% deposit before commencing any work, I would simply click the Deposit Button and input 25% as the deposit amount. A new Deposit invoice would then be generated with an amount of $500 (25% of $2,000) and the current invoice would then become the Balance invoice and would then change to an amount of $1,500 (75% of $2,000). The invoice numbers for both invoices will remain the same, except for a ‘-1’ being added to the end of the deposit invoice number.